Clint Eastwood succeeds in his directorial debut by creating a simple, yet enjoyable stalker thriller that is way ahead of its time back in 1971. Eastwood himself takes lead as late night disc jockey, Dave Garver, on a local radio station in California. Between spinning records Dave is a bit of a ladies man, a trait which lands him in trouble when he has a one night stand with a particularly fanatic fan in Evelyn Draper (Jessica Walter). After some impromptu visits and bouts of irrational rage it becomes apparent to Dave that Evelyn isn’t quite right, additionally the reappearance of Dave’s old flame Tobie (Donna Mills) complicates matters. 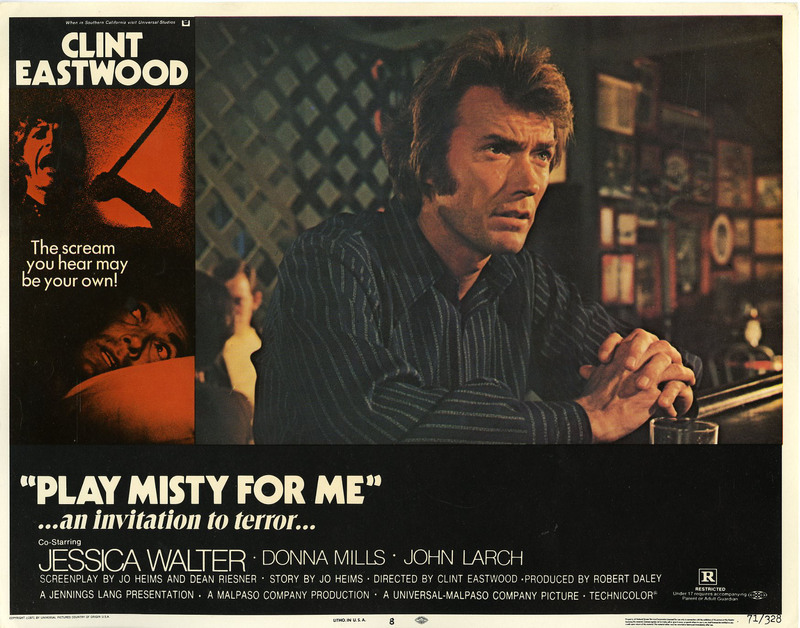 ‘Play Misty for Me’ may feel like a familiar plot due to the many reincarnations the obsessive stalker role has had over the years in cinema, ‘Misery’, ‘Fatal Attraction’ and ‘One Hour Photo’ to name just a few of the most memorable, but back in 1971 this was a fairly novel concept. Despite the saturation of the story Eastwood manages to put his own unique spin on proceedings that still impress some 40 plus years on. The slow methodical pace coupled with realistic drama that isn’t ludicrously over the top or action centric, as we are so often accustomed to in current cinema, is refreshing while making the story a believable one. Eastwood carries the film in his usual gruff no-nonsense way with dry humour and witty comebacks, think Dirty Harry if he had become a radio DJ. The only trouble with Eastwood is actually picturing him as a radio DJ, famously a man of few words in most of his roles it’s hard to imagine talking for 5 hours on air to be his best occupation, luckily the film skirts round this problem with few scenes of him actually working. While Eastwood may not be the chattiest it must be said that his deep husky voice does sound alarmingly great on radio. Eastwood’s support cast in fellow DJ Al Monte, the police sergeant and barman (played by renowned director and Eastwood collaborator Don Siegel) bring out the best in his character as he bounces off them, plying his trademark quips in the process to bring some comic relief to proceedings. Jessica Walter’s does a great job as an unhinged stalker, successfully avoiding the danger of overplaying the part. Walter’s character is slowly built up throughout the film as to leave the viewer, and Dave, subtle hints of her mental instability as she becomes gradually more unpredictable and dangerous. This measured approach sets the pace for the rest of the film which, although slow in places, manages to keep the viewer captivated as they second guess what Evelyn will do next. It’s only towards the end where the film loses its way slightly, highlighted in a painfully corny romantic scene that certainly detracts from the story. Departing from tradition Eastwood opts out using a musical score in keeping with traditional suspense thrillers. The lack of cues means that when the shocks do come they are out of the blue which leaves varied results; while in some instances the audience will get a jolt other times it can leave potentially tense sequences with a rather underwhelming climax. More puzzling is the incessant use of a jazzy soundtrack to most of the film, while contextually correct to match Dave’s job as a jazz DJ, it seems unnecessary and even detrimental to some of supposedly tense scenes, removing the suspense from the situation. ‘Play Misty for Me’ may feel more dated than the 70’s fashion in some areas, markedly the violent sequences which seem amateur and almost comical in this day and age, but the excellent foundations in plot, script and acting mean the film remains a good watch some 40 years on. Furthermore being Eastwood’s first venture into directing it makes for an interesting watch in terms of his progress behind the camera from then amateur to Oscar winner today.